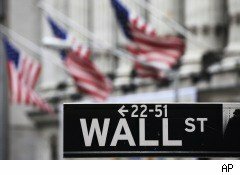 Pay on Wall Street is on pace to break a record high for a second consecutive year, according to a study conducted by The Wall Street Journal, growing 4% in 2010 at nearly three dozen of the top financial institutions. The 35 top publicly held securities and investment-services firms are set to pay $144 billion in compensation and benefits, up from $139 billion in 2009, according to the Journal survey. Compensation was expected to rise at 26 of the firms. The study also found that revenue was expected to rise at 29 of the 35 firms surveyed, but at a slower pace than pay. Wall Street revenue is expected to rise 3%, to $448 billion from $433 billion, despite a slowdown in some high-profile activities like stock and bond trading. Overall, Wall Street is expected to pay nearly a third -- 32.1% -- of its revenue to employees. The Wall Street Journal also notes the differences among companies. For example, at Citigroup (C), which remains about 12% government owned, revenue is projected to increase this year by about 4%, but pay will be down about 8%. At Goldman Sachs (GS), on the other hand, revenue is expected to decline by 13.5% this year to $39.1 billion, while compensation is projected to be 3.7% higher at $16.8 billion. Most of the companies have paid the government back the financial aid they received during the financial crisis and therefore have come out from under the Treasury Department's rules about pay. However, they're still benefiting from low interest rates courtesy of the Federal Reserve's stimulative policy and strong international markets. In Europe, regulators last week backed tougher than expected draft rules on bankers' pay. If they are implemented, cash bonuses would be capped at 30%, and large bonuses at 20%. Also, 40% of normal bonuses would be paid over several years, and 60% of big bonuses postponed. Finally, the regulations include a clawback mechanism that would allow for company's to reclaim bonuses. In the U.S., there will be some restrictions on pay in the upcoming Dodd-Frank financial regulatory bill, but the specifics aren't clear yet. Also, tougher new capital rules may also restrict compensation. But until the focus in financial firms changes to creating more shareholder value, some say, current compensation packages will remain. Experts say, however, that Wall Street banks are unlikely to pay 2010 bonuses until after the end of the year, even though this could hurt employees' tax bills, according to Reuters. Early bonus payments would be a public relations disaster for a sector already blamed for much of the financial crisis.